Artistic space with modern American cuisine and a hipster lounge. : Unlike other Dining As Art restaurants (Bistango, Bayside), which feature revolving art exhibits, the modern art at Kimera is built right into the tomato-red walls. 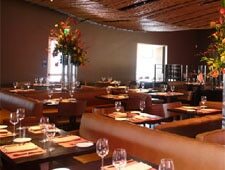 We like the simple and classy design: an earthy bamboo ceiling and semi-circular booths. Hipsters hang out either in the swanky indoor-outdoor lounge, the Zen-like dining room or the innovative charcuterie, cheese and wine bar, which dovetails nicely with the venue's offerings of modern American comfort food. Start on a high note with house-made charcuterie, like the Wagyu bresaola with other European cured meats, well-chosen artisan cheeses, pickled-in-house vegetables and accoutrements. The main menu is built on signature and seasonal appetizers, salads, soups, wood-fired pizzas and hearty entrées. At dinner, pair a glass of white wine with the macaroni and cheese or the peppery scallops with a risotto ball and contrasting fennel salad. Pizzas are rather good, but don’t miss the main courses. A tender hanger steak is accompanied by foie gras smashed Yukon Gold potatoes and charred Brussels sprouts. For dessert, try the made-to-order sugar-coated donuts with chocolate and honey crème anglaise dipping sauces. Compared to the aforementioned sister restaurants, the wine list at Kimera is surprisingly small, but the choices include mostly topnotch California and French labels.